Hawaii Volcanoes National Park is an excellent example of island building through volcanic processes. It is distinguished among other vulcanoes by its size and level of activity. The National Park was created in 1916 on Hawaii Island. It includes Kilauea, the most active vulcano in the world, and Mauna Loa, the greatest volcanic mass on earth and one of the best examples of a shield volcano. It had been a surprisingly long, and often frustrating, ten years since I last had the opportunity to visit a new WHS in person. Only a few recent inscriptions of places I had visited in the past were added to my total during that time. Then, in 2018, a hastily-arranged trip, which was part personal business and part pleasure, would allow me the opportunity to see seven sites that I had not previously visited. Chronologically, the last of those was Hawaii Volcanoes National Park. I have lived on the West Coast of the mainland USA for about 25 years, and during all that time I had a strong desire to go to Hawaii, primarily to see the ongoing eruption of the Kilauea volcano. However, as often happens, circumstances conspired to prevent any trip to the islands, and I consoled myself with the idea that if had indeed found the time to make a visit there, the over-thirty-year-long eruption of the volcano would probably have ceased days, or weeks, before my arrival, and there would have been little to see. I had never considered the possibility that the opposite situation would be closer to reality. As I was on the homeward bound segment of my recent trip, 10 days before I was scheduled to reach Hawaii, I was resting one evening in Malaysia, and decided to check in on some of the international news broadcasts, which was something I had not done for several weeks. 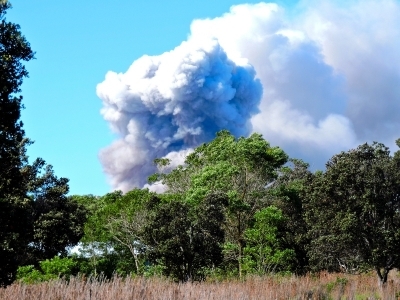 The first story that was reported was describing the evacuations of about 2000 residents who lived in neighborhoods about 40km from the main crater of Kilauea, as the volcano had just begun a major new eruptive phase. This activity was well outside of the Park boundary, and the WHS core zone as well, so I had no immediate idea what effect this would have on my visit. Consequently, I kept a close eye on the situation as I drew closer to the islands. Instead of subsiding, the eruption continued in force, though the bulk of the activity was still far outside of the Park. Nevertheless, three days before the day I had planned to spend touring this WHS, the entire Park was closed due to fears of an explosive steam eruption at the main crater, similar to the one that had previously occurred in 1924. As such, there was very little to see once I arrived. The road that traverses the Park was the only segment of the main park area that could be used, so I rode over that for a while, just so I could say that I was actually there. However, because of the forests and topography of the area, it was not possible to see much of the eruption from the road. Leaving the Park and going to the nearby Volcano Winery, which is not located in the closed area, or in the WHS, was the only way to get a decent view of the venting material. It was actually very interesting to watch from there for a while, as the ash-laden steam plumes pulsed with increased intensity every two, or three, minutes, as if one were watching the respiration of the Earth itself. The photo attached to this review was taken from that location. During this time, lava plumes were still affecting the neighborhoods far to the east of the Park. However, as much as I would have been fascinated by seeing that, because there was no reasonable access to the active zone, the possibility of hazardous gas emissions, and, most importantly, out of respect for the people who were in the process of losing their homes, I made no attempt to go to that area. In ordinary cases, reaching the National Park by bicycling is fairly straightforward when coming from Hilo, the main town to the Northeast. That involves a climb of 1100 meters over a distance of about 50 km. However, the scenery along the route is rather nondescript, and the ride is not really very interesting. Coming from Kona, on the west side of the island would be longer, but probably a little more scenic. In either case, one would reach Volcano Village, just outside the WHS, where there is a limited choice of food and accommodation, all of which are, not unexpectedly, a little on the pricey side. It isn't guaranteed you'll be able to see an active lava flow at (or outside) Hawaii Volcanoes National Park, but if one is active and accessible while you are visiting, it is an unforgettable sight. 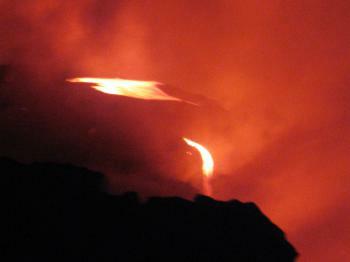 I was fortunate to see lava flows at night both times I visited in 2010 and 2011, and they were incredible. The Pu'u O'o eruption on the eastern side of Kilauea volcano has been flowing intermittently for over thirty years, crossing park boundaries, destroying housing developments, and nearing the town of Pahoa in 2014. Just west of the town of Pahoa are guides offering night-time hikes to the Pu'u O'o lava flows outside the park, and in 2010 I was able to watch lava flowing into the ocean on one of the tours. Officially the park warns about the dangers of walking out to the lava flows with a guided tour, so it is up to visitors as to whether they want to take the risk. Inside the park you can see the glow of a lava lake active within Kilauea crater, as well as trails traversing former eruptions. The lava lake rose high enough to be visible in April 2015, but has since subsided. Whether or not lava flows are active when you visit, it is pretty awe-inspiring to witness some of the youngest landscapes on earth. Logistics: The airport in Hilo is the closer airport on Hawaii's Big Island, and the park is a short drive away. Pahoa and the Pu'u O'o flows are east of the park, but are not directly accessible from the park. 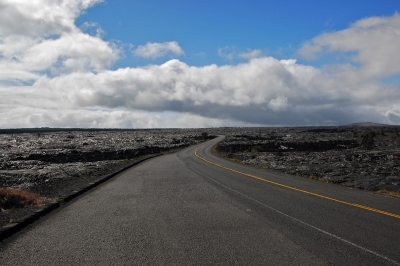 During a recent visit to the 'Big Island' of Hawaii we traversed the islands Saddle Road between Waikoloa and Hilo, and gained dramatic views of extinct Mauna Kea and active Mauna Loa. We also drove up to the Kilauea Caldera in the Vocanoes National Park and hiked part of the way around the perimeter. 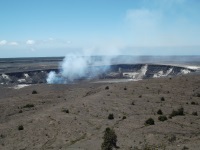 Steam and fumes were rising from the Halema'uma'u Crater within the caldera. Later we travelled the Chain of Craters Road which led past several vents, across lava fields, down an escarpment and ended at the lava cliffs where the flow ended in the sea. 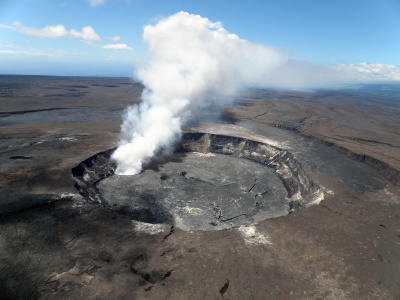 Hawaii Volcanoes National Park requires at least two visits: One by land and another by air. On my trip there it was raining (It does that a lot) but that did little to sour the experience. I drove on the crater rim drive which was absolutly spectacular. Then as it got darker I headed down to the sea (with the rest of Hawaii it seemed) to see the latest lava show. It was truely one of the most amazing moments in my life; the lave glowed a brillient orange and the seemingly tranquil hillside was streaked with fire. Then, on a later day I explored the lava and Mauna Loa from the air in a small little plane. Despite having already seen mcuh of the park, the plane ride gave a whole new perspective. This is one of the most beautiful and awe enspiring places in the world. Within Hawaii Volcanoes National Park lies the volcano of Kilauea – one of the world’s most active and accessible volcanoes. If you want to see molten magma etc this is the place to go. Except of course that it isn’t always erupting and the eruption isn’t always convenient or safe to see. Unfortunately, when we were there, the only visible “red spot” required a helicopter ride – and we were left with the remains of a previous magma flow crossing (and blocking!) a road (photo). Luckily we saw our “red spot” on a later trip to Etna albeit not as impressively as we would have liked. There are web sites (eg http://www.volcanogallery.com/Volcano_news.htm) which provide you with up to the day information during an eruption if you are able to drop everything and take in the sights at their optimum time (However I understand that there are a lot of volcano watchers in the world and that transport can get pretty full at these “best” times). The IUCN review dated 1987 states that the volcano has had “more than 50 recorded eruptions in the last 33 years up to 1985”. There does not appear to be an eruption as of the date of this review (Jan 2006)! If, like ours in summer 1987, your visit to the park doesn’t coincide with a major volcanic event, the Park still offers plenty to see both in terms of the main crater and magma flows and also in terms of fine mountain scenery (Mauna Loa is 13600 ft above sea level) and seashore views, forest and bird life. There is also a Hawaiian “aboriginal” “temple” at Waha’ula Heiau (which is said to date from 1275CE) – but, although inside the Park boundaries, this is NOT included in the criteria for the site designation which are purely “Natural”. Another aboriginal archaeological site on Hawaii a few miles away at Pu’uhonua o‘Homaunau was rejected for inscription by UNESCO in 1987 – the same year that the Volcanoes Park was accepted. Remember that a trans-Pacific flight will “drop” you several islands away at Honolulu on the island of Oahu so this park can’t be picked up that easily on a quick Pacific stop-over. But the Hawaiian Islands justify more than this anyway and it would be a shame just to visit Oahu whilst you are in the area. We visited Volcanoes National Park and would say it was one of the top 5 places we have ever visited. When we visited we were able to hike approx 3 miles and were able to get very close to the flowing lava. In fact, there were tourists roasting hot dogs over the lava and having picnics. The glow of the lava as the sun went down was beautiful. We stayed that night in July at a room at the Volcano House within the park. This building overlooks a steaming caldera. It was very inexpensive - around $60 for two. Don't miss this! We are taking our children this April so they may experience it. Recently Active Volcanoes: Kilaua has been eruptng lava continuously at Pu'u 'O'o since January 1983. It is currently the most active volcano on the Earth. Mauna Loa's most recent eruption occurred from March 24, 1984, to April 15, 1984. Mauna Loa is a "Decade Volcano"
Captain James Cook: First recorded visit by a European to the Islands. Isabella Bird: Visited Hawaii in 1875 and published her travels in "The Hawaiian Archipelago. Six Months among the Palm Groves, Coral Reefs and Volcanoes of the Sandwich Islands". Letters V and XXV describe her climbs of Kilauea and Mauna Loa.